Castleford's Jy Hitchcox thanks the fans. 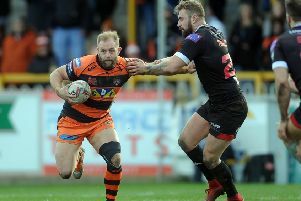 JY HITCHCOX hopes to continue his fine start in Castleford Tigers colours and prove he is worth a new deal. The Australian winger, who initially signed just a 12-month contract in November having played with Championship club Featherstone Rovers last season, has quickly impressed Daryl Powell. He has scored five tries in just six games, including a hat-trick in Sunday’s 38-34 win versus Huddersfield Giants, although he sits out at Widnes Vikings tomorrow due to an ongoing hand injury. “I set a goal at the start of the year to play 10 games and I’m almost there already,” said the 26 year-old from New South Wales’ Byron Bay. “There’s been a few injuries around so that gave people like myself an opportunity. “I’m happy and taking it as best I can. I’m really enjoying it at Cas. Everyone’s been really accommodating, I get along with the boys well and I’m enjoying the spirit of the club that comes with all that. “I’m not too sure about the future and obviously anything can happen. But there’s an option there of another year and that’s in the club’s favour. Hitchcox scored a brace on his Super League debut in the win at Hull FC when Joel Monaghan was a late withdrawal and has shown versatility playing full-back, too. Hitchcox’s third try against Huddersfield, meanwhile, sealed the win. “I got a bit lucky with some good balls from Luke Gale, Ryan Hampshire and Jake Webster,” he insisted. “I didn’t actually have much to do apart from getting to the corner as quickly as I could. “With Widnes, they went well at the start of the season but didn’t go too well over the Easter period. Powell won’t let that continue tomorrow, however, especially as Monaghan and fellow winger Denny Solomona are fit enough after their own injuries to return to Castleford’s 19-man squad. So, Hitchcox – who has barely trained of late – is rested while centre Ben Crooks is out for up to a month after bruising his kidneys against Huddersfield and prop Grant Millington (thigh) is also missing from that side.